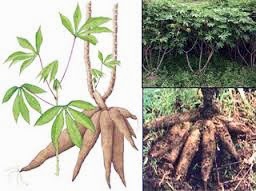 Cassava is trunked tree plant soft or brittle (easily broken). Cassava trunked round and jagged, who occurs from the former base of the petiole, the middle like a cork and tall trees. Cassava can reach a height of 1-4 meters. Maintenance is easy and productive. Cassava can thrive in areas with elevations of 1,200 meters above sea level. Cassava leaves have long stalks, leaves strands like palms, and each stalk has about 3-8 pieces of leaves, leaf stalks colors are yellow, green or red. Rheumatism, fever, headache, diarrhea, intestinal worms, eyes blurred, appetite, festering wounds, new injuries by heat. A. Ingredients: 1 stalk cassava. How to use: drink 2 times a day, morning and afternoon. B. Ingredients: 3 sheet cassava leaves finely ground. How to use: Use as a compress. Ingredients: 7 Sheet cassava leaves. if the child of diarrhea disease are still breastfeeding, the mother who should drink the potion. Ingredients: 1 Cut a piece of cassava grated and squeezed to take water. Take a few moments until the flour settles. How to use: flour smeared on the injured body part. Material: Stem young cassava leaves, finely ground. 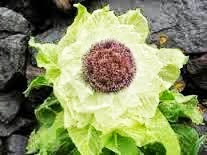 How to use: the herb is applied on the body part who festering wound. Method: Boil, give the salt and garlic sufficiently. How to use: eat like a salad. How to use: Eat with rice and tomato chili sauce. Cal 146 calories, 1.2 grams protein, 0.3 grams fat, 34.7 grams carbohydrate, 33 mg calcium, phosphorus 40 mg, 0.7 mg of iron. 0.06 mg Vitamin B1, Vitamin C 30 mg, and 75% of the fruit eatable. Tannins, peroxidase enzymes, glycosides and calcium oxalate.